AT&T Bold 9700 Appears in Price List for $399? *UPDATE* It is $599 full retail, $399 with a new account after $100 rebate. The middle price you can kind of see is the bundled price. We’re assuming the $199 price tag that is supposed to be at launch will be a launch promotion. 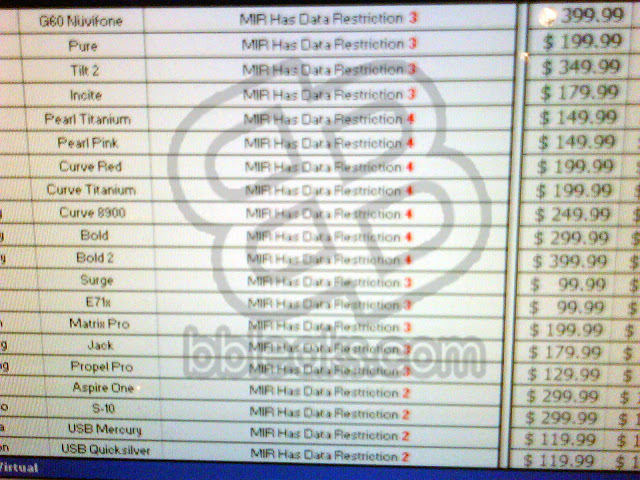 Here is the latest AT&T price list, which shows the BlackBerry ‘Bold 2’ aka Bold 9700 for $399. We’re assuming this is the price without a contract and obviously before a rebate. In the official AT&T press release is says the Bold 9700 will cost $199 after a $100 mail-in rebate. We’re curious why the Bold 9700 is listed for $200 more than it should! AT&T most likely decided to drop the price in hopes to compete with T-Mobile, who stated they were selling the Onyx for $200, which seems to be the trend in price for newly released smartphones. If we find out anymore info on the price difference we will update the post. Thanks goes to our AT&T ninja!